Recently, the Jule III and her crew conducted a two week trip around the DelMarVa peninsula. The purpose of the cruise was to test vessel, crew, and electronics in preparation for a longer passage in late 1999. The Jule III recently received new sails, new standing and running rigging, a new engine, and significant work on the hull. The crew has little experinece working with the boat or each other. The Integrated Electronics Suite (IES), which consists of radar,digital camera, computerized navigation and acquisition systems, and a Single Sideband (SSB) radio, needed to be tested and integrated into the operational environment. The map to the left was generated from the GPS tracks stored in the IES. The voyage, which involved an Atlantic passage, include visits to Solomon's Island, Tangier Island, Cape Charles, Ocean City, and Chesapeake City. 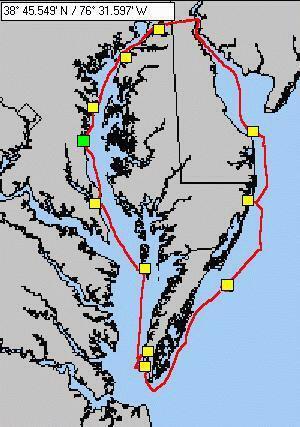 In addition, anchorage stopovers included Kiptopeke, the Harbour of Refuge at Cape Henlopen, Still Pond, and Annapolis.